Half-full? Half-empty? Neither . . . I ran across this image on FaceBook that had various answers to the classic “Is the glass half-empty or is it half-full?” question. The glass is classically rendered with the water level appearing about half-way up the height of the glass. After considering the possible answers I decided that the only one that was correct was the surrealist because the two equal length frustums (one filled with water and the other air) had different volumes. But this was an offhanded observation that I felt needed some proof. Sooo . . . here we go. So where along the x-axis is half full? There are a couple of ways to approach this question but since we’re already thinking about the above diagram as a solid of revolution and with a little programming a general approach for all glasses can be devised. Well, ok, they aren’t exactly equal . . . the difference is 3.708323 X 10^-6. Close enough. The glass with the correct amount of fluid in it would look like the following. My understanding of the Common Core State Standard Initiative is that it is a set of guidelines as to what students are supposed to learn at various grade levels. How those guidelines are met is left to the individual states that adopt the CCSSI. You can read more here and judge for yourself. I’m not here to argue whether the CCSSI is good or bad, or if it impinges on “States Rights” or if it’s a tool of Satan. I just want to address one REALLY BAD piece of pedagogy. I recently ran across the following image in a Facebook posting complaining about the Common Core Math requirements. I’m also assuming that this is the entirety of the problem. The rest is (not so) obvious. In fact it’s mind swivelingly hard to interpret. So for all you parents suffering through addition problems like this here’s my explanation. The method in the image is basically asking what number can we add to 26 to force the carry of a one. Well, that would be four. That gets us to thirty but what about the 17? Since we already added four to 26 we have to adjust the 17 down by four before adding it to the 30. That’s where the “17 = 4 + 13” comes from. Still a little fuzzy? 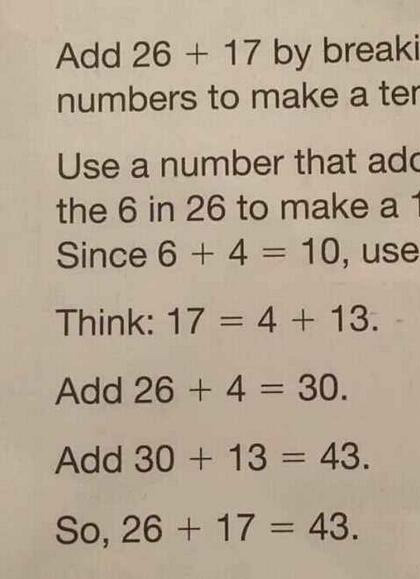 Can you imagine asking a first or second grader, “Use a number that adds to the 6 in 26 to make a 10’s”? I was the little turkey that would always ask, “Why?” That hopefully would lead to a discussion of the carry operation. But this example doesn’t go there. It states, “Think: 17=4+13.” This is a complete non sequitur and doesn’t engage the student in any sort of problem solving activity. It commands “Think” and doesn’t address rational stepwise solution. So, if you’re fuzzy don’t worry. This is how I would break the problem down (if for some completely twisted reason I was going to teach addition this way . . . which I wouldn’t). We are going to use a non-traditional method to add the two digit numbers 26 and 17. First we’re going to find a number that when added to 26 causes a carry into the ten’s place. Add 4 to 26. Using the “Old Math”, six plus four is ten, write down the zero and carry the one. One plus two is three giving thirty. Because we adjusted 26 up by 4 (forcing the carry) we must adjust the 17 down by 4. This is where the “17=4+13” comes from. In fact this should be “17-4=13” since that’s the actual computation we need to do . . . but I guess subtraction isn’t covered until next week so we have to “Think” our way around it. Now we can add the 13 to the 30 and get 43. So actually all we’re doing is adjusting one number up to the next multiple of 10 and adjusting the second number down by the same factor before adding. Reverse the above problem: 17+26. You can almost do it in your head. (17+3)+(26-3) = 20+23 = 43. I have several issues with the method. It only works for two digit numbers. Since it only addresses the carry from the units place this method fails to accurately add three, four, or five digit numbers. It’s not general. Want to make a kid cry? Tell them to use this method to add 998+427. I’m being a stickler here but you just can’t pull the six out of 26 and operate on it. Intuitively you can but formally you have to isolate it with a modulo operation. Since I spent the time pulling the method out of this horrid bit of pedagogy I might as well formalize it a bit. Here goes. If x and y are two, two digit integers to be added together the following equation will produce satisfactory answers. where x mod 10 is the remainder after division, e.g. 17 mod 10 = 7. Ok, need a laugh? Think things are tough now? Here’s a song from the 1960’s by Tom Lehrer. Click here to enjoy.